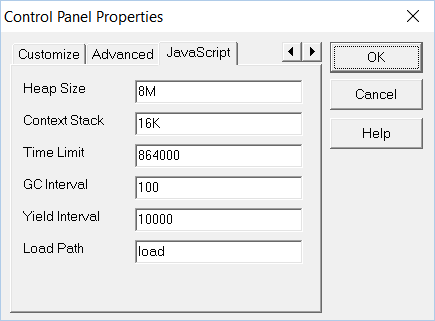 The Synchronet Control Panel Properties page is available through the File→Properties menu option. 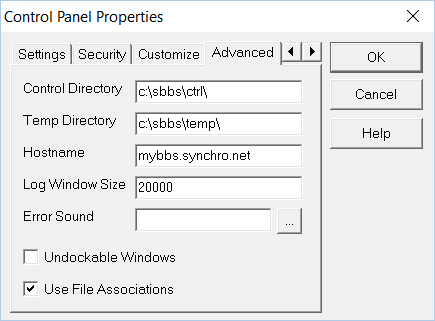 Most of the values set in this dialog are saved in your Synchronet sbbs.ini file. The Login Command is what is invoked when the BBS→Login menu option is used. This is a telnet URI by default, pointing to localhost which should start the Windows default handler for Telnet connections, but you could put any command-line here. The Config Command is what is invoked when the BBS→Configure menu option is used. Normally this will be a command to invoke SCFG. The first %s will be replaced with the path to the Synchronet exec directory. The second %s will be replaced with the path to the Synchronet ctrl directory. This setting controls the frequency of updates to the “Node” window in the Synchronet Control Panel. This setting is only applied when the Node window is visible. This setting controls the frequency of updates to the “Clients” window in the Synchronet Control Panel. This setting is only applied when the Clients window is visible. This setting controls the frequency at which semaphore files are checked. Lower numbers mean more disk or CPU activity, even while the BBS is idle. When checked, this setting will place a small icon in the Windows “system tray” or “notification area” (usually in the lower right corner of your display) when the Synchronet Control Panel is minimized rather than a normal icon/button on your task bar. The system tray icon is also animated when the BBS is in use. When minimized to the system tray, you can optionally require a password to be typed by the local user for the Synchronet Control Panel to be restored/visible. This is a very simple security measure to help prevent un-trusted users of your system from stopping or re-configuring your BBS services (when minimized). An advanced malicious user could easily find other ways to stop or reconfigure the BBS. 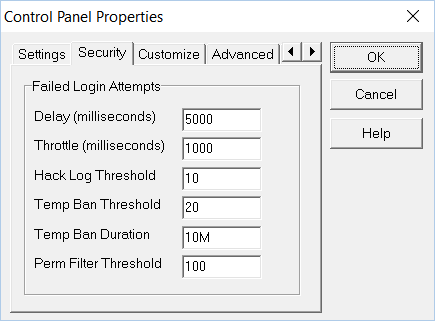 The settings on this tab control the automatic throttling, logging, and filtering/banning (both permanent and temporary) of clients (IP addresses) that repeatedly try and fail to login to your BBS. See How-To: block-hackers for more details on these settings. Customized settings for one window can be easily cloned into another window by using the Apply Scheme To: button. 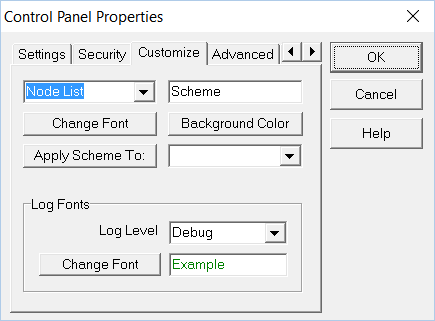 The Scheme text box just shows an example of the current color/font scheme for the selected window. Changing the upper-left window selection resets the current scheme to that of the newly selected window. Changes to that scheme can then be made with the Change Font and Background Color buttons and then applied to a new window by selecting a target window with the lower-right window selection and clicking the Apply Scheme To: button. This setting points to your Synchronet ctrl directory. The value is normally automatically derived from the SBBSCTRL environment variable, but you can override this value here if you wish. This setting determines where Synchronet will store temporary files. The default is temp off of the same parent directory as your ctrl directory (i.e. ../temp). The DNS host name of this instance of Synchronet may be over-ridden using this setting. If not set, the value from SCFG→Networks→Internet→Address is used for the system's public host name, where needed. 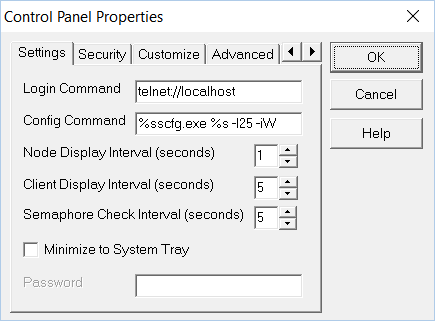 Log windows in the Synchronet Control Panel consume memory (for scroll-back history). To limit this memory consumption, set this value to a specific number of lines (log history) to store in the Window. Logs written to disk are not limited by this setting. This setting is used to specify the path to an optional WAV file which will be played on the local/server system every time there is an error condition detected in the system and logged. Checking this box allows the child windows of the Synchronet Control Panel to be “undocked” from the parent window and floated (e.g. on another monitor). Checking this box causes the Synchronet Control Panel to use Windows' file associations for opening text and configuration files with common file extensions/suffixes (e.g. .txt, .cfg, etc.). When unchecked, a simple text editor built into the Synchronet Control Panel will be used to open and edit these types of files.